RTD's female characters still had aspects of their personalities which didn't revolve around the Doctor/other men, though. 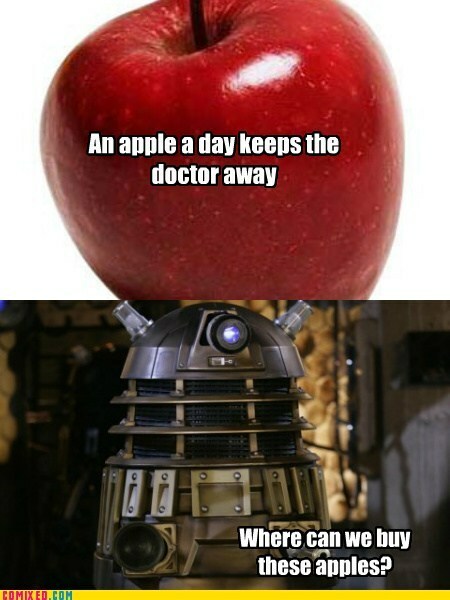 Rose was in love with the Doctor but she also had other important values. She wanted to change her life for the better, she cared about her mum and Mickey. Martha was similar. Although she was in love with the Doctor, she took charge of her own life and could out when she needed to. The next time we saw her she had her own career and was doing things in her own right. Apparently Moffat wrote the scene where we see Martha spontaneously married to Mickey when Ten goes back to check on his old companions before regeneration - the most ridiculous and pointless character development I've ever seen. Moffat also wrote Blink - an otherwise good episode - where the main character, a really well-developed female for a change - ends up getting together with the nearest man at the end. Did we think she was independent and strong on her own? Whoops, we were wrong. Turns out she needed a man all along and just didn't realise. Wouldn't things have been easier if she'd noticed she was head-over-heels with him in the first place, everything would have been done much quicker. /sarcasm. I know, especially as she was supposed to be engaged to another guy as well! I completley agree. I think, however, that we need another companion that isnt completley Doctor obsessed (with the exception of Donna, but thats another rant :P) Due to the type of character we've seen I think Clara will be similar to past companions. Yeah - that's just what I'm worried about. I feel like Clara is going to end up having every aspect of her personality revolve about the way that she relates to the Doctor (whatever the reason is, something is causing her to keep being drawn to him in some kind of universal way). I've liked all the companions if I'm honest. Except Catherine Tate! But I think if there is any who should have a romantic attachment with the doctor it's Clara. She seems closer to him than any other companions. Just my opinion! I loved Donna, partly because she wouldn't take any crap from the Doctor. She was with him of her own choice and she was going to do things her own way. She always saw through the things that other companions fell for so easily. But personally I think Martha was the one who I'd expect to be closest with the Doctor. And I think that if he hadn't still been dealing with losing Rose, he would have loved Martha even more. Martha was clever enough to really get the Doctor and keep up with him all the time. Rose just seemed to fawn over him and watch a lot of the time. Series 7 Part 2 looks utterly incredible to me, and with a plus, it starts tonight! Donna was my fav for sure. SO gutted she left. Is the Doctor not married to River still? I think the Clara character looks good and there is a series paradox. Also, I think that, considering that time surrounding the doctor/river is so mish-mashy, back to front and all that, I don't think their marriage really counts. Everyone ready? Got plans for tonight's post-show parties, etc?? Martha was a king sized pain in the rear. Better yet, turned off the WiFi? But how would I follow the conversation about the show while watching? Besides - they can't get all of us in the 40 minutes before the doctor does something magical with the sonic when Moffat remembers the story needs resolving. What?? And miss the tweetstorm? ?